Madeira Beach FL is a sleepy little Gulf Coast town west of St. Petersburg FL. Home of John's Pass Village, it has beautiful white sand and some good beach bars. It's a small Florida beach town that combines the laid back charm of Old Florida beach life with the modern amenities of today. 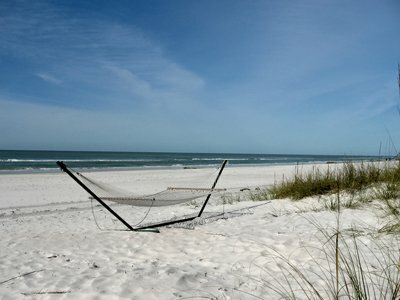 Located on the final two miles of Sand Key, it is home to less than 4500 folks. It's out-of-the-way personality and beautiful beaches draw discriminating visitors from all over. The sand is sugary soft and you can hear it squeak when you walk. It is perfect for a laid back Florida beach vacation. Madeira Beach begins at about 155th Avenue (on Gulf Blvd) to the north and ends at John's Pass...a dynamic tourist trap of souvenir shops, restaurants, bars, and parasail rides. 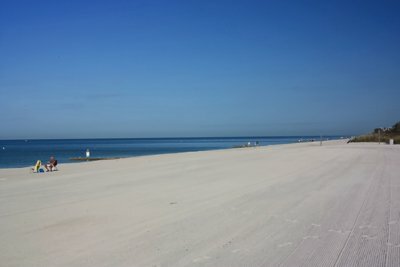 From Gulf Blvd, the island appears overbuilt, but all of the condos, cottages, and motels hide a truly beautiful beach. 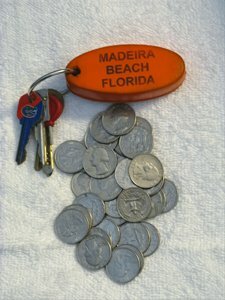 You can walk almost everywhere if you have a room on Madeira Beach, however, bring lots of quarters if you are staying off the island. Parking costs 25 cents for 15 minutes ($1.00 per hour) and is strictly enforced by both the city Parking Patrol and the Pinellas County Sheriff's Department. It is not worth it to ruin a nice Florida beach vacation with parking ticket issues. You can buy $10 rolls of quarters over at the Winn-Dixie grocery by City Hall. Keep them in your car. Many visitors who live part-time in St. Pete, purchase a parking pass for about $35/month over at the City Hall, on 150th Avenue across from Winn-Dixie supermarket. Across from the intersection of Gulf Boulevard and Madeira Way. It has a covered picnic area, restrooms, showers, and metered parking. You'll see a big log cabin, which used to be "The Snack Shack," back in the day. On Gulf Boulevard between 144th and 146th Avenues. It has about 100 metered parking spaces, restrooms, and showers. This is a tiny little park with five parking spaces and a couple zoned for Handicapped parking. It's on Gulf Boulevard between 140th and 141st Avenues. It has a small covered area for picnics, and showers. There are no restrooms here. Across Gulf Boulevard from John's Pass Village. There are nice restrooms, a covered picnic area and ample parking, with a boardwalk to the beach. This beach has nice sand. Be aware that swimming near the jetty is both dangerous and stupid. Currents are swift and there are lots of lost fish hooks around the area. Even though there are signs posted, some people insist on being idiots and find themselves in "a situation." Just walk a few minutes north and you should be fine. 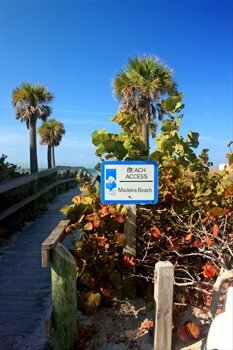 There is also additional public access at many of the avenues which dead-end at the beach. Most have parking, but some are only a walking trail. You'll find metered space on the following avenues: 130th, 131st, 132nd, 133rd, 134th, 135th, and 141st. None of these has a restroom or shower. John's Pass is actually an outlet that allows water to flow from the Intercoastal Waterway to the Gulf. It is a natural division between Madeira Beach on Sand Key to the north and Treasure Island to the south. The rock jetty is a popular fishing and sight-seeing spot. It has a nice sidewalk that leads under John's Pass Bridge to all of the little shops, bars and restaurants. John's Pass Beach is convenient in that you can get down there early, watch fishing boats leave, relax, get a tan, go for a an easy walk, go for a swim, take a shower and mosey over to John's Pass Village for an outside meal or cold beer. It can get pretty crowded in the evenings and you can hear the boisterous laughter from the hugely popular "Gator's Bar" across the Pass. At the northern end of Johns Pass Village is a revival of the Madeira Beach landmark, The Bamboo Beer Garden...although it goes by a different name, now. It has been closed and reopened several times with many owner changes. I've always liked the place, although now it has gotten way more commercial. It's not like 50 years ago when you'd see three or four guys with their heads on the bar. Still, it's a great place to checkout. You can toss a dead cat and find a place to stay on Madeira Beach. Some are pretty steeply priced, others are more reasonable. I am partial to two places which maintain the charm of the Old Florida beach era. Both are right on the sand. These are one room efficiency apartments. Clean, but non-desript...they are perfect for someone who wants to spend most of their waking hours on a Florida beach. Seaside Apartments are located at 13446 Gulf Boulevard in Madeira Beach FL. Office hours are 9 AM - 9 PM. You can reach the office at (727) 234-5563. Weekly rates run between $425 - $600, depending on "the season"...meaning the units are more attractive in the mild weather of the winter and spring. A combination of 1BR, 2BR and efficiency apartments located at 14048 Gulf Blvd in Madeira Beach FL. You can reach The Beach Flower by phone at (727) 642-7120 or Toll Free at (800) 873-0224. Weekly rates: $750 - $1200 depending on season and size of unit. Madeira Beach FL is a quiet place to spend a relaxing day at the beach. It is laid back and unpretentious. Yes, people congregate right at the major access sites, but if you walk a few minutes north or south along the ocean, you can easily find a large area to read, snooze, or sit with a cold one from your cooler. The only drawbacks about this little community are that the beach bars are across Gulf Blvd and the nightlife is not as jumping as it is on Treasure Island Beach, St. Pete Beach, Pass-A-Grille Beach, or Indian Rocks Beach. Do I have to worry about Stingray Season on Madeira Beach?